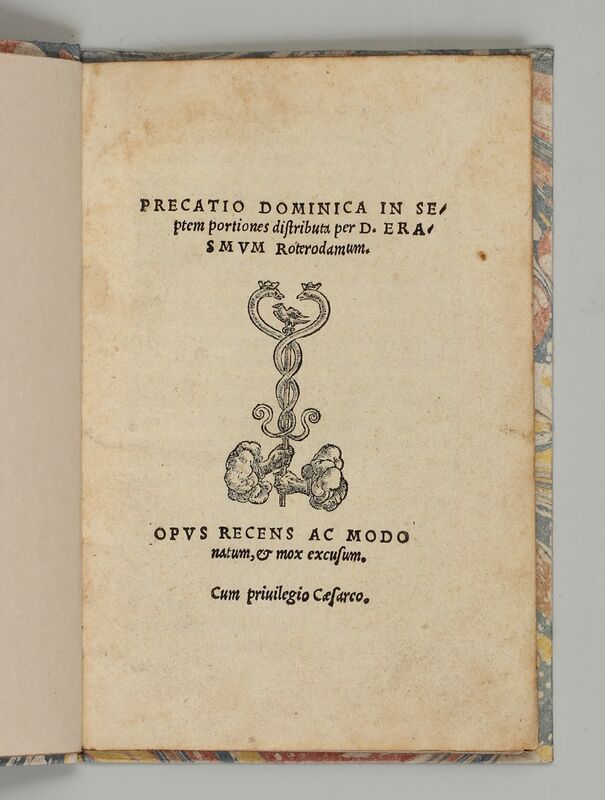 Precatio Dominica in septem portiones distributa per D. Erasmum Roterodamum. 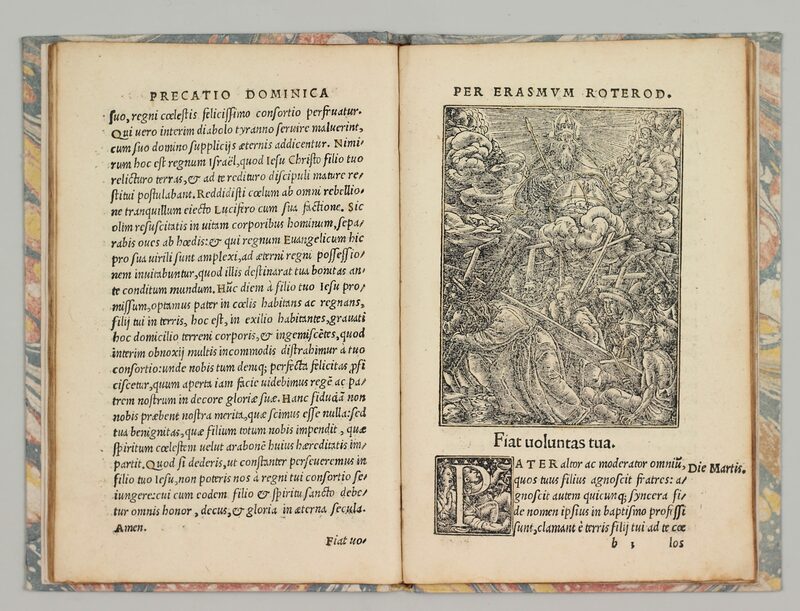 Opus recens ac modo natum, & mox excusum. 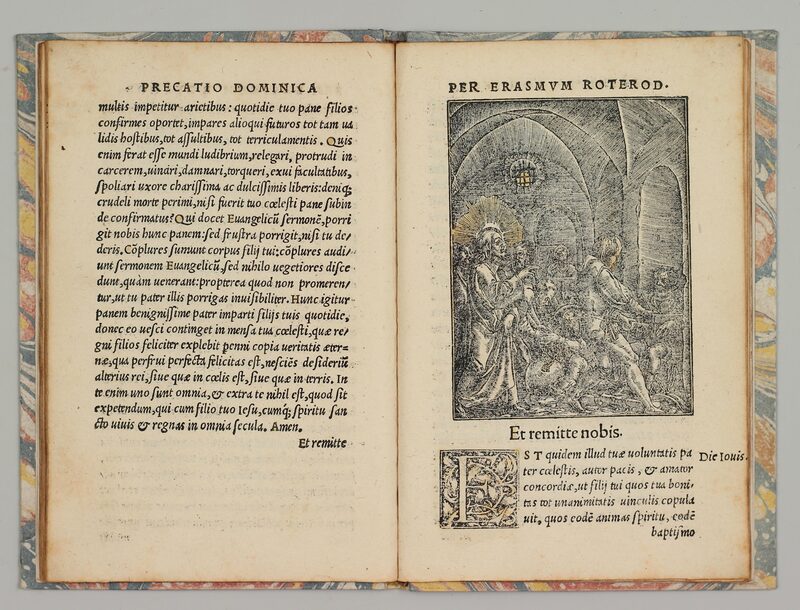 — (Basel), Johannes Froben, (beginning of 1524). ab8 c4: (20) leaves. 8 metalcuts. 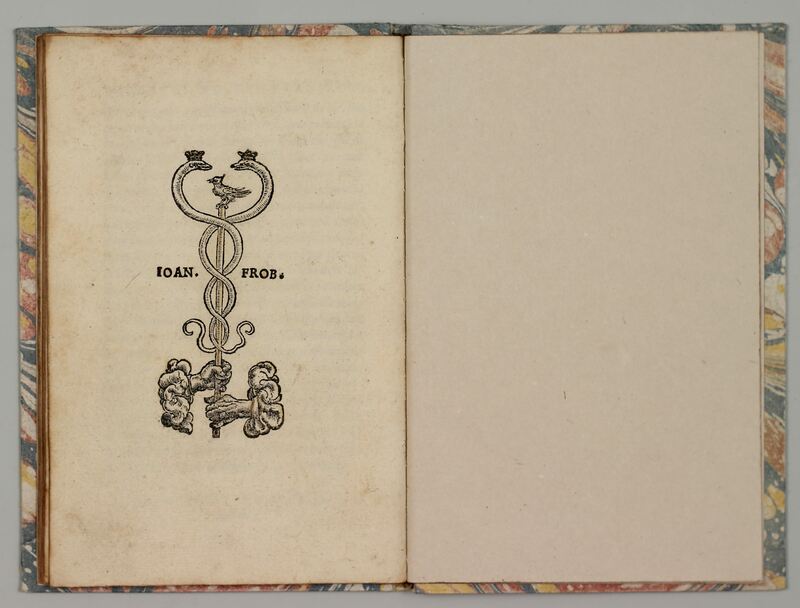 Froben’s mark on title and last leaf. One letter of the printed marginal note on leaves a4r, a5r and b5v cropped. Modern boards. 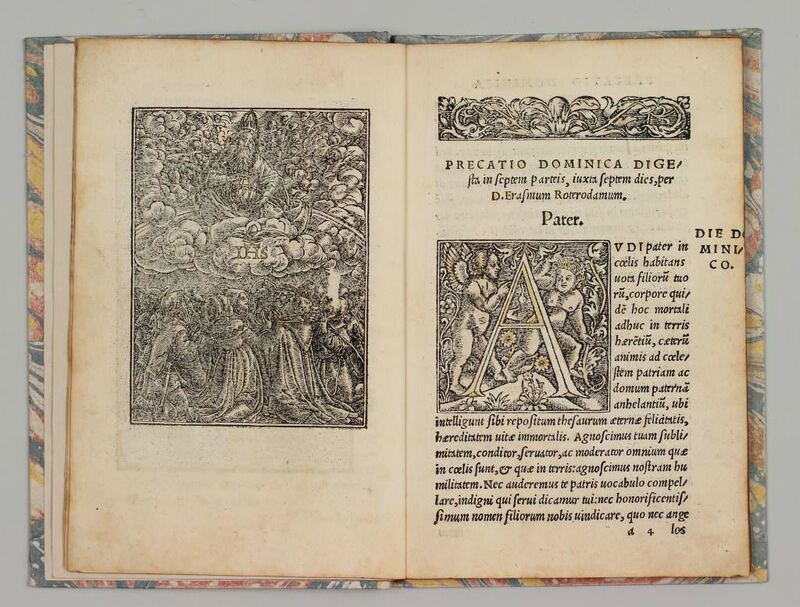 – Bezzel 1622; VD16 E-3450; Erasmus Online 3205. 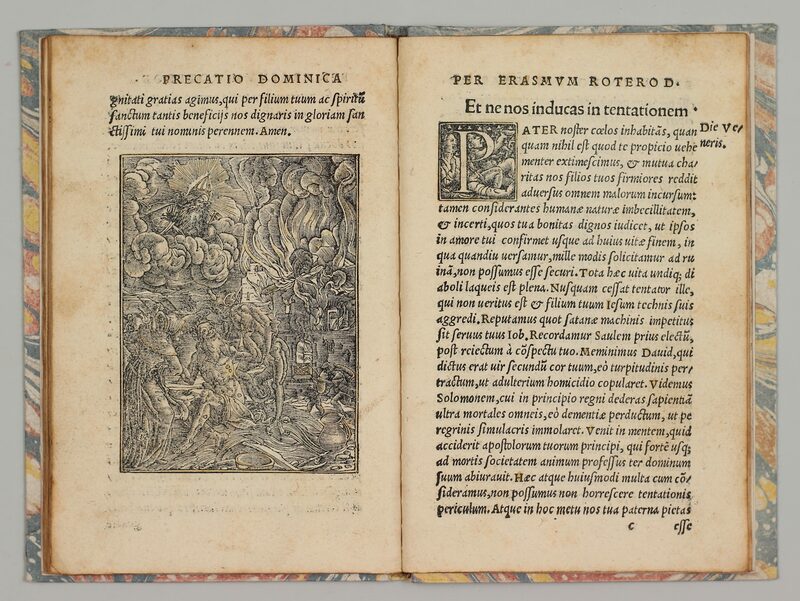 „With 8 outstanding illustrations by Hans Holbein the Younger, cut in metal by the Monogrammist CV (measuring 86/87 x 65 mm). 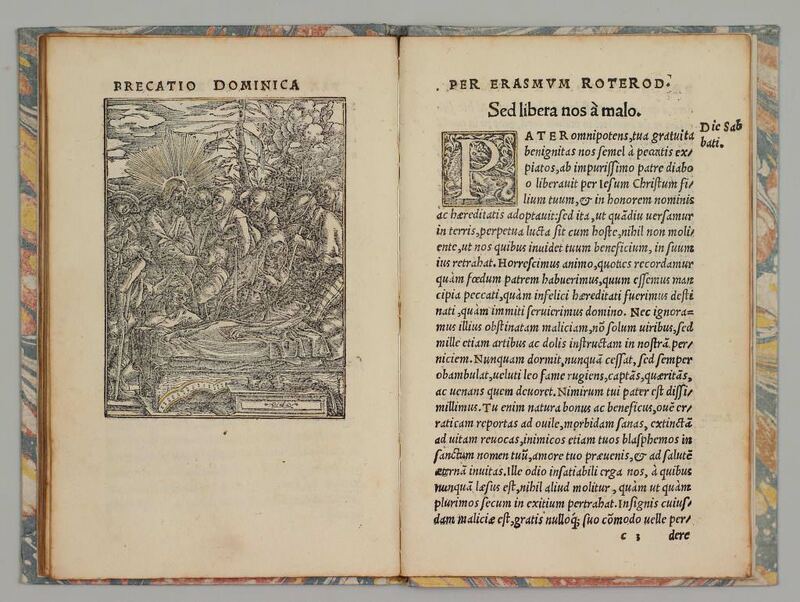 First illustrated edition of Erasmus’ commentary and interpretation of the Lord’s Prayer (Praecatio Dominica), written at the request of and dedicated to Jostus L. Decius (Ep. 1393). 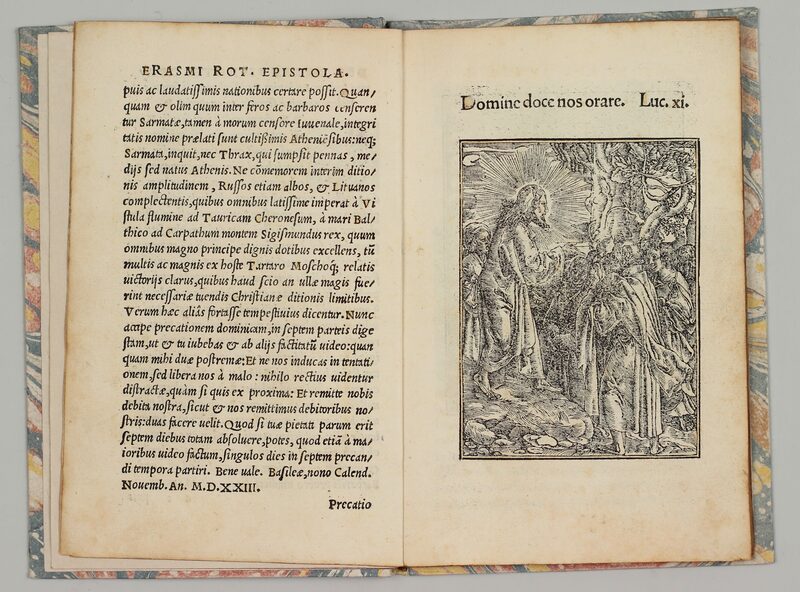 The first, unillustrated edition was apparently printed (in November/December 1523) immediately after the text was written, while Holbein and the metal-cutter CV were still working on the illustrations. Koegler, and following him, H. Reinhardt (in Einige Bemerkungen zum graph. Werk H. Holbeins d.J. in Zeits. für Schweiz. Archäologie u. Kunstgeschichte, vol. 34, 1977, pp. 237ff. 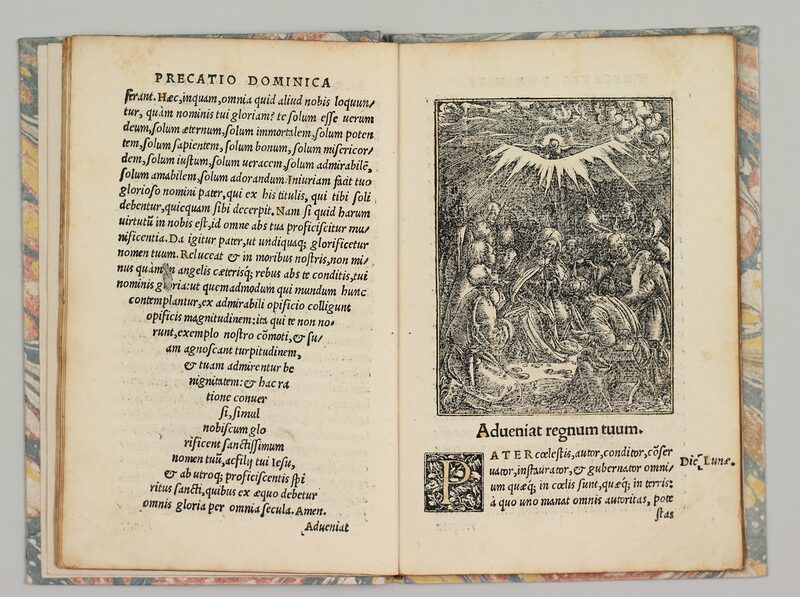 ), have shown with convincing arguments that the illustrated edition could not have been finished earlier than by the beginning of 1524. Owing to a misinterpretation of the engraver’s initials, Woltmann (1874) and some other scholars thought that these cuts were by Urs Graf, but today art historians have them unequivocally restored to Holbein (cf. Basle Holbein Catalogue, 1960, no. 397, and H. Reinhardt, op.cit.). 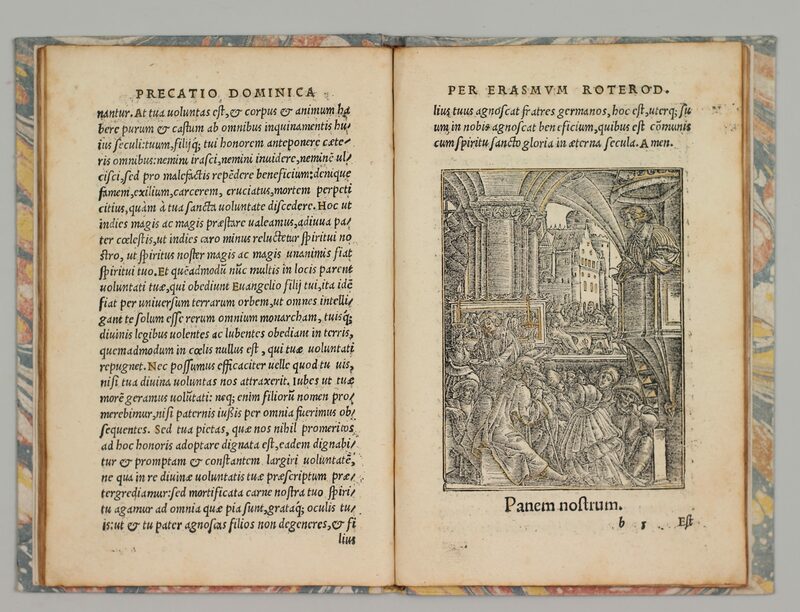 These eight metalcuts indeed convey the grandeur of Holbein’s design and rank among his finest contributions to book-illustration. The dedicatee, Jostus Ludovicus Decius (or Dietz; c. 1485-1545), was a native of Weissenburg in the Lower Alsace who emigrated at an early age to Moravia. There he became a successful and rich business-man and administrator to Sigismund, King of Poland. He spent his wealth lavishly on the encouragement of art and learning and also became a patron of Erasmus.